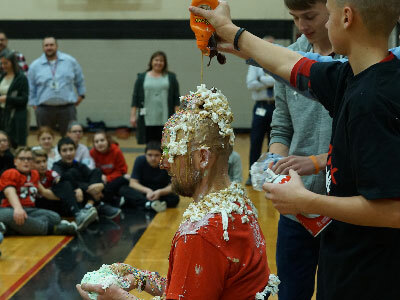 This year the students at Warwick Middle School raised a total of $1500 to donate to the American Heart Association as part of “Hoops for Hope.”The students raising the most money from the dodgeball and volleyball tournaments had the the opportunity to turn Warwick Middle School Principal, Mr. Szobocsan, into a human sundae — on his actual birthday no less. The money that was raised goes to American Heart Association research efforts and local community activities that support CPR and wellness education. Members from the winning teams got to shower Mr. Szobocsan with ice cream and various toppings.A human sundae he most certainly was.